The National Fire Protection Association (NFPA) recommend your chimney should be cleaned and inspected annually. Any Fireplace, stove or insert that burns combustible materials, such as wood, coal or hardwood pellets should have their chimney’s cleaned & inspected on a regular basis. When an individual burns combustible materials, those materials create smoke and as the smoke cools it creates a by-product, known as creosote.This creosote is a build up that occurs on the interior linings of the chimney. This creosote can become flammable when this build-up becomes excessive, usually around 1/4″ or greater. Once you have the excessive creosote build up, all it takes is a hot fire or even sparks to ignite the creosote on fire. The chimney fire will begin to intensify using any oxygen it can find from inside your home, as all fires need oxygen to burn. This can increase a very strong draw up through the chimney which may be heard as a loud roar, as some have reported the sounds of a freight train in their home. The more creosote build up, the more fuel the fire has to burn. A chimney fire can burn up to 2100*F, which can deteriorate and compromise the integrity of the chimney’s structure. In some cases, the chimney fire will emit “hot balls” of creosote and excessive sparks on to your homes roof and nearby structures or dry grass. These “hot balls” of creosote can ignite one’s roof /home on fire causing loss of property or even loss of life. It is very important to have the fireplace and chimney inspected, for any structural problems occurring from normal “wear & tear”, weather related damages, or from a previous chimney fire that may have occurred. If you are buying a home, you may decide you need to get the fireplace/chimney inspected for potential hidden or unknown structural damages. This may save a home buyer from getting stuck with expensive repairs on a house they just newly purchased. An inspection consists of a visual inspection done at the time chimney is cleaned. Chimney caps are something every chimney should have installed. A chimney cap can be constructed of galvanized, stainless steel and even copper. Most of our chimney caps mount to a flue liner or the cement crown at the top of the chimney. 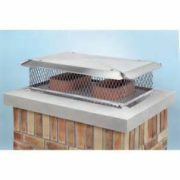 A chimney cap has 3 basic components- a lid/cover with an overhang to prevent rain from entering the chimney, a screen mesh to prevent birds or other small animals from entering the chimney/home and a reinforced mounting base. I do not recommend using any other method of mounting a cap to a chimney, such as leg kits or tensioners. These forms of mounts can eventually release the cap, causing the cap to become a flying projectile, especially in high winds. There maybe an additional charge for installing a chimney cap. However, we do guarantee all of our chimney cap installations and our stainless steel & copper caps do come with a limited lifetime warranty. Our galvanized caps are painted black and come with a 5-year warranty. We do stock a wide variety of cap sizes and mounts, but in some cases, we may have to order a cap to get a proper fit, which may need to be custom or semi-custom. We also carry specialty caps, such as the copper “Chess Piece” style. We can usually do most minor repairs during the chimney cleaning process. However, most major repairs usually have to be rescheduled for another available day. Crown replacements, major lintel repairs or flue re-linings are considered major repairs.